Top 100 MLB.com/bloggers: Get your badge! 1. Log in to your blog’s dashboard. 2. Go to Appearance > Widgets. 3. Grab the Image widget from the list of available widgets in the left side (they’re in alphabetical order), and drag it over to the top of your active widgets on the right side. 4. Enter ONLY the following information in the Image widget. 5. Hit Save and you’re all set. The badge should display at the top of your blog’s sidebar, just as it does in this blog. Another memorable baseball season ended with San Francisco celebrating a third World Series title in five years, and Giants blogs like SF Giants Photos, Bumgarner Snotrockets, Cove Chatter, and More Splash Hits rank among the traffic leaders for October. Meanwhile, the fired-up Hot Stove blog is prepared to take its customary place atop the rankings. Put the first piece in place for your own championship season by creating your own MLB.com Blog, powered by WordPress.com. 39. It’s Always A Good Dre in L.A. The instant classics of this Major League Baseball postseason have given MLB.com Bloggers plenty to write about. Brandon and Brandon can share first-person accounts of October glory, while the brand-new Cardinals Insider is an absolute must-follow as the Redbirds seek their 12th World Series title. (How fast will it take the 11-time world champs to climb this list, currently dominated at the top by Dodgers?) Interestingly, only one of the top 11 MLB.com Beat Reporter blogs — #7 Britt’s Bird Watch — focuses on a team still alive as of this posting. Get in the game and take the first step to making our Latest Leaders by creating your very own MLB.com Blog, powered by WordPress.com. 45. Step up to B.A.T. 33. It’s Always A Good Dre in L.A.
One of our August Leaders is Oakland A’s bat boy Austin Ginn’s excellent Another Day In The Office. Make sure you’re following him, as well as the Rockies’ brand-new photography blog, What’s On Deck? Take the first step toward making the cut along with them by getting started with your very own MLB.com Blog, powered by WordPress.com. As we enter the stretch run, MLB.com writers’ Trade Deadline blog rode the huge buzz around rumored and actual deadline deals to the overall top spot. Meanwhile, legendary baseball scribe Tracy Ringolsby’s Write ’em Cowboy and the Astros’ Mission Control blogs made their Latest Leaders debuts as expected. In the fan blogs, Rays Renegade’s Tilted Cap continues to draw a huge audience. Want to join them? Take the first step by setting up your own MLB.com Blog, powered by WordPress.com. While you are no doubt hard at work supporting two favorite candidates in the All-Star Game MLB.com Final Vote Sponsored by Experian, we have some other suggested stars to show you here. It’s the monthly Latest Leaders for June. Is your blog listed? If so, brag about it in the comments! MLB.com Blogs is the place to be during the second half of the season as new fan bloggers like The O.co Show share their insights alongside a Hall of Fame scribe like Tracy Ringolsby. If you haven’t yet discovered his blog, Write ’em Cowboy, it’s an absolute must-follow and a lock to make its Latest Leaders debut next month, along with the relaunched Trade Deadline juggernaut. 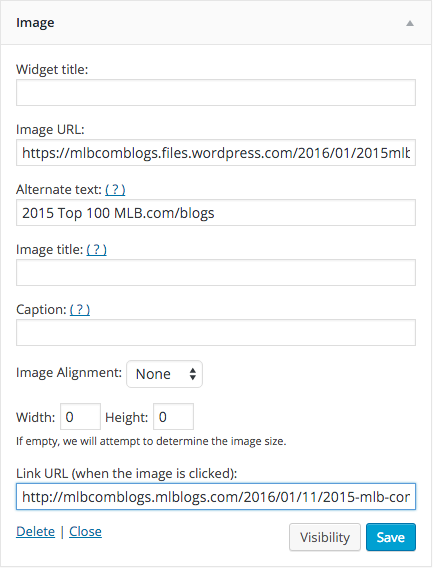 So get in the game by creating your very own MLB.com Blog, powered by WordPress.com. 49. Step up to B.A.T. The All-Star Game is approaching rapidly so make sure you’re casting your ballots for the starters and tell us about your picks! Whether it’s the Midsummer Classic or blogging, one of the joys is seeing standout veterans such as MLB.com Fantasy 411 and the recently renamed Bleacher Banter excelling alongside talented newcomers like On Cloud Conine and Baseball’s Relatives. Ours is truly an international game, so wherever you are, take the plunge today and get started with your own MLB.com Blog, powered by WordPress.com. In April we officially started our 10th year of MLB.com Blogging. Whether you’ve been here since the beginning or are new to the fold, thanks for helping make our blogging community what it is! This is the only place around where baseball fans can blog alongside writers, broadcasters, players, and front office members. So join the party and start your very own MLB.com Blog today and enjoy the coolest dashboard features in blogging thanks to a partnership between MLB Advanced Media and WordPress.com. All is right in the world again, as we settle into the familiar pattern of baseball’s regular season. Make certain you’re following the Padres’ brand-new blog, Friar Wire — an excellent addition to our community. And say Happy 9th Blogday to Murray Cook and Jonathan Mayo, whose PRO blogs were created on the first day of MLB.com Blogs history back on April 18, 2005. There’s no time like the start of the season to start your MLB.com Blog — you could follow the example of this month’s debutantes like Beantown Baseball Birthdays and Hit Bull Win Blog, and find yourself in a future Latest Leaders. 50. Step up to B.A.T. 44. Spring Training With Sydney!